Federal Bank PO Notification 2018: Federal Bank is one of the topmost private banks in India. Federal Bank has recently released the Federal Bank PO Notification for the recruitment of Probationary Officers (Federal Bank Officer Scale 1) in various branches of the bank. The online registration for the exam has started on 14th August 2018 and eligible candidates can apply for the exam till 27th August 2018 on the Federal Bank official website – federalbank.co.in. However, before applying for the Federal Bank PO exam 2018-19, aspirants must go through the Federal Bank PO Notification 2018. 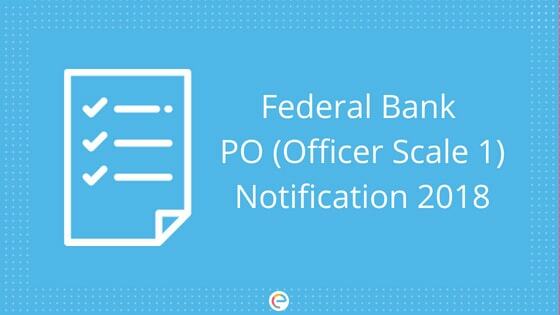 In this article, we will provide you with all the important information regarding Federal Bank PO Notification 2018. Read on to find out. Nationality Candidates must be a citizen of India. Place of Domicile Candidates’ place of domicile should be Maharashtra, Gujarat, Karnataka, Kerala, New Delhi, West Bengal, Tamil Nadu, Haryana, or Punjab. Age Candidates born on or after 1st July 1994 (26 years as on 1st July 2018) are eligible to apply for post of Officer Scale 1. Educational Qualification Candidates holding Post Graduate degree in any discipline from a recognized University with a minimum 60 percent marks and have completed the course 2017 or 2018 can appear for the exam. Step 1 Go to the official website of Federal Bank – federalbank.co.in. Step 2 Go to the “Careers” tab. Step 3 Click on “Current Openings”. Step 4 Click on “Recruitment Process 2018-19”. Step 5 Click on “Apply Now” after reading the instructions. Step 6 Click on “Click Here for New Registration”. Step 7 Enter your Name, Email ID, Mobile Number, etc. and register yourself. A Provisional Registration Number and Password will be generated for you. Note that down. You can login again with this Registration Number and Password later. Step 8 Upload the scanned copies of your Photograph and Signature in the required format and size. Step 9 Fill up the other details – Academic and Personal Details. Step 10 Verify the details and then go to the “Payment” tab. Step 11 Make payment of Federal Bank PO Application Fee. Step 12 Submit your application form. Step 13 Take a print out of your application form for future reference. There is negative marking of 0.25 for each wrong answer. After the Online Aptitude Test, a psychometric questionnaire will be given to the candidates which they have to answer in 15 minutes. Candidates shortlisted from the Online Aptitude Test will be called for the second phase of the recruitment process – Group Discussion and Personal Interview. The Federal bank PO Admit Card will be released on the Federal Bank Official website – federalbank.co.in. Candidates will be informed through SMS/Email via their registered phone number and Email ID. Candidates will have to login using their Registration Number and Password (generated during online registration) to download their Admit Card. Upon selection and joining, Federal Bank Probationary Officers will have to serve a probation period of 2 years. Now that you know everything about Federal Bank PO Notification 2018-19, apply for the exam if you fulfill all the eligibility criteria. Then start your Federal Bank PO preparation. With just a few days left before the exam, you should use your time wisely. You must finish the whole Federal Bank PO syllabus and take Federal Bank PO mock tests. You can take Bank PO mock tests on Embibe for free. With Embibe’s Advanced Test Analysis, you will know your areas of improvement which, in turn, will help you to improve your score. We hope this detailed article on Federal Bank PO Notification helps you. If you have any query regarding Federal Bank PO Notification, feel free to ping us, we will definitely help you out. Embibe is India's leading AI Based tech-company with a keen focus on improving learning outcomes, using personalised data analytics, for students across all level of ability and access. © 2017 Indiavidual Pvt. Ltd. Enter your Email or Mobile below. We will send you a reset password link. What are you preparing for?